The snow sure looks refreshing today, in the heat of summer. I'm panting in the heat, but I wouldn't give it up for snow. LOL! I'm sure the little birdy flew south for the winter like all the smart birdies do. oohh I can relate to that weather! 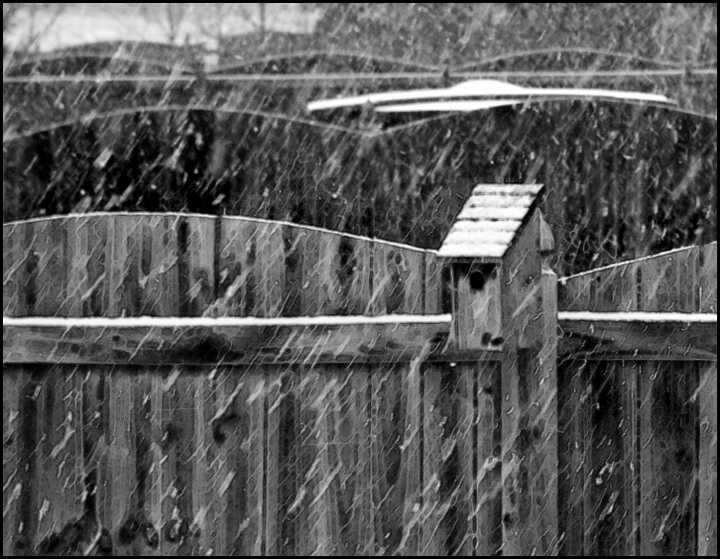 I like your subject birdhouse on fence and the snow is coming down fast and furious.. Very nice contrasts.. Nothing but rain here, ugh. Snow? I don't know.. I do like your capture though, the opposing textures and contrast of darks and lights work really well. Good job. Proudly hosted by Sargasso Networks. Current Server Time: 04/22/2019 04:18:56 PM EDT.